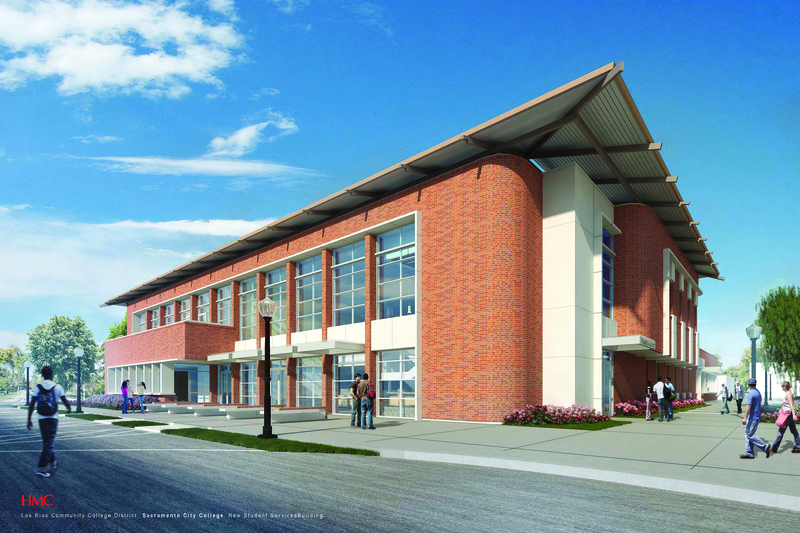 A rendering of the new Student Services building, which will replace the now deconstructed Student Services and Administration of Justice building by early 2015. Image courtesy of HMC Architects. The Administration of Justice building will be torn down beginning June 17 to make way for a modern Student Services facility, projected for completion in February 2015, according to City College public information officer Amanda Davis. The tear-down is one of many construction projects that will begin over the summer to improve the campus. Several parking lot improvements will also impact the college. Once completed, the planned two-story Student Services building will house on its first floor many of the services now in Rodda North. On the second floor, the journalism and photography departments will reside in a joint state-of-the-art facility. In addition to the new Student Services building construction, a makeover of staff parking in G lot, between Lillard Hall and Rodda South, will begin when the lot closes May 22, according to a campus email sent by Davis’ office. Construction is scheduled to be completed by July 22. The improvements will include 12 additional parking spaces, new lighting, Americans with Disabilities Act compliance and safer, more efficient entry and exit points. “There will be plenty of spaces in other staff lots to accommodate our needs,” Davis said. East Road will also gain an additional six parking spaces for staff once the May 23 project begins. Traffic controls are expected, according to Davis. The construction will be completed July 22, as well. This entry was posted in News, Sac City Express (SCC) and tagged 2013, Administration of Justice, americans with disabilities act, campus improvements, construction, new building, public information officer, Sac City College, sacramento, student services. Bookmark the permalink.